My College Options matches your child's interests, talents, and goals with over 5,000 accredited institutions. As soon as your son or daughter enters his/her freshman year, it's difficult to avoid casting an eye towards the future. After all, high school can often feel like a mere stepping stone to college. But, as you well know, the road to higher education is paved with lots of preparation and planning. 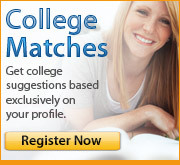 If you’re unsure of where to begin, look no further than My College Options' Resource Center. Chockfull of articles and advice, we can help you navigate everything from test prep advice to securing a teacher recommendation and all points in between!